Print trousers are a staple in every woman’s wardrobe. They’re fun and make a fabulous style statement but knowing how to style them can be tricky. With bold stripes, floral prints and polka dots on trend, there’s no better time than now to step up your style game! Wide-leg trousers are so versatile and add a chic flair to any outfit. 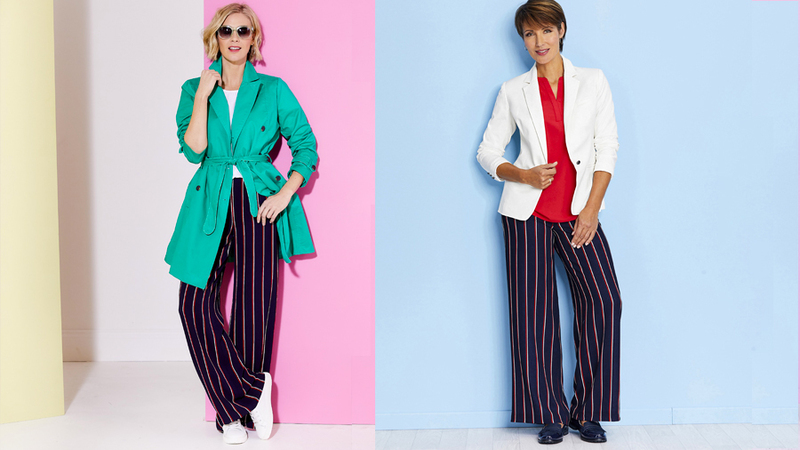 New to our collection, these bold stripe trousers come in a flattering cut with semi-elasticated waist so comfort is never compromised. For a casual yet effortlessly chic look, team trousers with a white crisp t-shirt and trainers. And on cooler days, a green trench coat creates a color combination that is unexpected but works beautifully and adds playfulness to the outfit. For a smart option, pair with a bright red blouse with Tunisian style collar for a pop of colour and a pair of loafers. Loafers are a great alternative to heels for a smart look. And to finish off the outfit nicely, you can never go wrong with a white tailored blazer. They are a classic wardrobe essential and add sophistication to an outfit. It’s time to swap your plain straight trousers for a pair of polka dot print trousers! The almighty polka dot print never goes out of style and is a great way to incorporate fun into your outfits. Ideal for work and play, these straight leg trousers are cut from a cool fabric in a relaxed fit so you feel as good as you look all day long. For a relaxed but fresh look during the day, pair these polka dot trousers with a white or pastel pink sweater and white trainers. Our white trainers are super comfortable and give you the perfect amount of style for weekend plans with friends and family. And if you’ve got a dinner date with the girls or special plans, simply swap your trainers for heels, your sweater for a pretty white blouse and throw on a biker jacket for a cool and edgy look. This Suedette Biker Jacket in a pretty shade of pink complements the white and pink polka dots. The only thing better than cropped trousers on holiday are floral print cropped trousers! They simply brighten your outfit and can be paired with a variety of colours, especially if they’ve got a striking print like this one. These cropped tailored trousers feature a discreet elasticated waist for complete comfort. Have fun with bright colours and pastels to create different looks with your favourite printed cropped trousers. A white t-shirt might seem like a safe option but pairing it with a pastel pink jacket and lilac moccasins is anything but safe. Or be bold with a bright yellow blouse that complements the floral print and adds excitement. And to complete your look, swap your spring/summer sandals for a pair of stylish and comfortable mules.